Hooray for time off! This is lovely....the pinks and embossed gold spatters are perfect! Wonderful card, Karren! Such a fantastic way to use those various challenges together! I hope you will be well rested on your break. Glad you found (and joined) us at SOS! 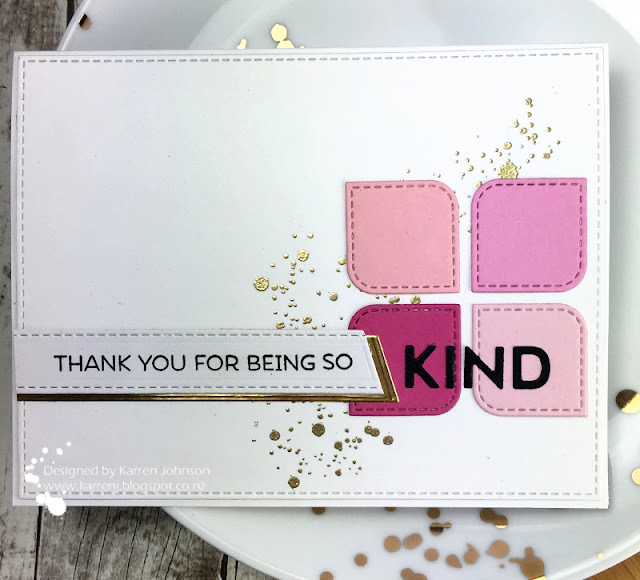 Love the pink blocks on your card! Thanks for going PINK with the crew from SHOPPING OUR STASH!! Hi, and welcome to SOS! This card is so clean and cohesive-- your extra efforts to stay with the stitched theme paid off! The gold accent paper and splatters are my fave touch! Thanks for visiting, and hope you bookmarked us for Tuesdays in 2018! Oh, you make the most beautiful cards, Karren!!!!! Love the pink and gold!!!! I need one of those vacations! Lucky you that you've got some time off. I hope that you are appropriately rejuvenated!! By the looks of this card I'd say you are! 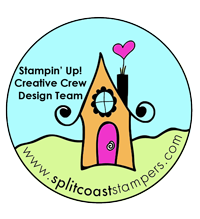 I love those mod squares and the splatters of gold embossing behind them. This is a fabulous card! Glad that you found us! Your card is gorgeous! CAS with just a touch of splattery goodness! 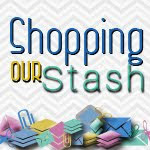 Thanks for joining us at Shopping Our Stash! 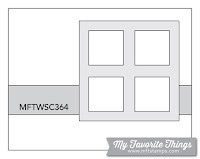 Your mod squares are perfect for the sketch and I'm loving all those pretty shades of pink! Clever idea to emboss the distress pattern in gold, too...Awesome card, Karren! Karren, you used those stitches in all the right places! The shades of pink and splats of gold are lovely too! 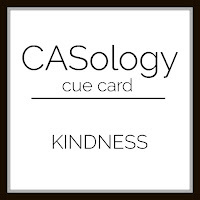 Thanks for sharing with us again at CASology!